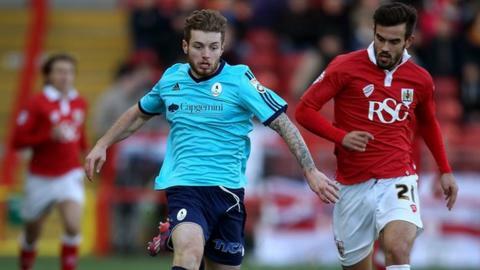 AFC Telford United face competition from Conference rivals Chester over the future of full-back Ryan Higgins. The Bucks brought in Higgins, 20, as a free agent on non-contract terms in mid-September following his release by Birmingham City. But while Telford have struggled, he has been an individual success, having not missed a game and has been offered an improved, extended deal. "We've made Ryan a very healthy offer," said managing director Lee Carter. Liverpudlian Ryan Higgins joined Birmingham City following his release by boyhood club Everton in 2013, but did not play a first-team game and left St Andrew's in the summer. "In fact, it is the best we have offered to a player of his age. "We have outlined how we wish to progress as a club and how valued Ryan is and how important a role he has to play. "Ryan is currently thinking things through with his agent." Higgins' original decision to sign only on non-contract terms was because he still wanted the chance to play league football and did not want to be restricted by a contract. But Chester put in seven days' notice on Christmas Eve and are understood to have been in contact with Higgins, who has been named in the Telford squad to face Nuneaton on New Year's Day.